Rafting Grand Canyon last year was a bucket list item, a one-time opportunity to do something I’d dreamed about my entire life. I came into that trip with ridiculously high expectations, all of which were exceeded enough that I scheduled another, then waited a year to find out whether the first one was just lightning in a bottle. After departing our Las Vegas hotel at 4:45 a.m. and flying to a small airstrip near Lee’s Ferry, we met our guides, absorbed a thorough orientation from Wiley, our experienced, knowledgable, talented, hard working lead guide (this would describe all of our guides), and were on the water before 10:00. We were 2 rafts packed with 28 rafters, 4 guides, equipment, camera gear, and food to sustain the entire operation for six days. Most in the group were first-timers, excited for sure, but also a little anxious about what lay ahead. Fortunately, starting from Lee’s Ferry, the first day on the river is relatively benign, a gentle float that allows neophyte rafters to ease into the experience and get to know each other. Bobbing downstream at a leisurely pace, we were sprinkled by a few riffles (mini-rapids, unworthy of a name), enjoyed a delicious lunch in the shadow of Navajo Bridge, listened to a couple more brief, on-raft orientation talks, before pulling onshore for the day at around 4:00 p.m.
Our first campsite was at Upper North Canyon in the Marble Canyon section of Grand Canyon (yes, that’s a lot of Canyons). We stumbled through our first “fire-line”—the raft trip equivalent of a bucket-brigade (you know, for when you’re barn’s on fire) that unloads pretty much the entire contents of the raft in about 5 minutes. (By the end of the trip we’d become a well oiled, fire line machine.) After claiming a campsite (picture a 19th century style land rush) and setting up my camp (basically picking a campsite, assembling a cot, and tossing out my sleeping bag), I grabbed my camera and went down to the river in search of an image that would do the view justice. Though our campsite was chosen for its convenience (location, size, topography), its beauty was pretty representative of Grand Canyon’s entire length. Regrettably, pictures and words cannot display the relentless, humbling awe that engulfs all who venture between the Grand Canyon’s vertical walls. But of course that won’t prevent me from trying. 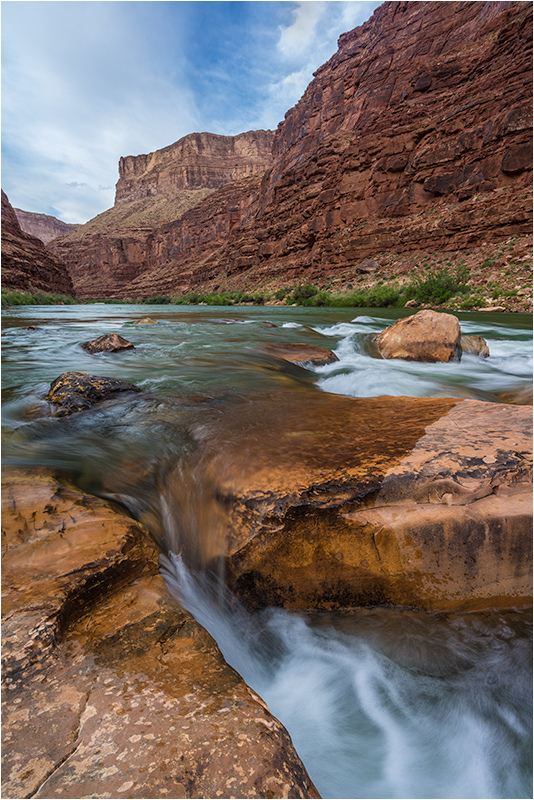 In this scene I was most struck by the color: the white-on-blue sky, red sandstone walls, and deep green of the Colorado River. Bisecting all this color was a set of white, rock-wrapping rapids. I dropped low and compose wide with my 16-35 to emphasize the foreground rocks and rapids; a vertical orientation included the sky and created the sense that the river was flowing into my frame (and eliminated our campsite, which was just out of the frame to the left). In refreshing contrast to last year’s trip, the clouds cooperated wonderfully, defusing the late afternoon light to subdue the potentially extreme dynamic range. To convey the water’s motion, I experimented with different shutter speeds, ultimately dropping to ISO 50 to maximize the blur. The clouds gracing this scene were a harbinger of exciting weather ahead. And while that weather made a good deal more discomfort than the previous year’s trip, it also gave us a corresponding increase in the number of photo opportunities. Stay tuned…. Awesome start to your trip, Gary. Looking forward to hearing how it went when you hit the big rapids… These images are fantastic. Thanks, Jane. As a matter of fact, I do have an up close and personal experience with one of the big rapids to share. And then you can share how your equipment survived… I’ve never been so scared as when we hit the big rapids on a trip through Cataract Canyon! Thanks Gary , you are one who is blessed in life , and we who see your experiences are blessed too . Have fun and as always have a wonderful tme . Thanks again for the vacation through your views . > Ralph in L.A., Ca. Lovely set of photos, Gary. Although it’s a year away, I am looking forward to next year’s GC river trip with much excitement and anticipation.